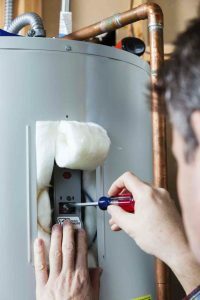 Trust Master Plumbing to help you find the best hot water heater for your Rockville home! Your hot water heater is one of the most important appliances in your Rockville home. It is responsible for hot showers, washing clothes, washing dishes, and so much more. If you’re looking for a new water heater in Rockville, look no further than Master Plumbing. When searching for your new hot water heater, you will have many options available to you. Conventional water heaters (also called storage tanks) are just one of those options. When you turn on the hot water faucet in your Rockville home, a pipe in the top of a conventional water heater will carry hot water directly to you. Every time water is pulled from the top of a conventional water heater, cool water is fed through a pipe at the bottom, ensuring that it is always full. When it comes to your Rockville hot water heater, size matters. You will want to make sure you have plenty of hot water to go around! Typically, conventional water heaters start at 30 gallons. Some hold up to 80 gallons of hot water! gas/propane- There is a gas burner underneath the tank that heats the water. Oil- These conventional water heaters create a mist of oil and water that is ignited by an electrical spark to heat water. Electricity- An electric conventional water heater has either one or two heating elements. One heating element is at the bottom, and it maintains a constant temperature in the water. In models with a second heating element, the second heating element helps to heat water faster when demand for hot water is higher. The water in your Rockville conventional hot water heater is continually being heated 24 hours a day. Whenever you need hot water, it’s always there! Conventional water heaters have a temperature dial so that you can set the temperature based on your preference. Just don’t set it too high, as you can easily be burned. A conventional water heater contains a thermostat, which works similarly to your Rockville home’s thermostat. It measures the temperature of the water in the tank, and if the temperature falls below what you’ve selected it will engage and heat the water to proper temperature. The type of water heater you need will depend on the size of your Rockville home and the type of fuel source available.